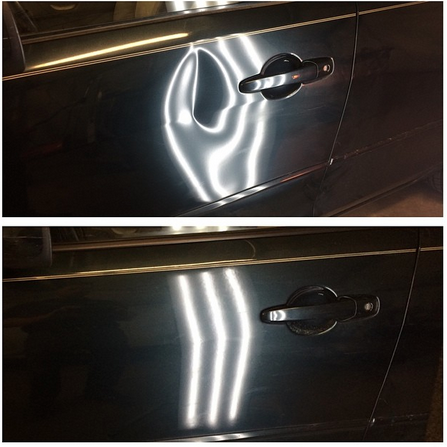 Paintless Dent Repair is the process of repairing minor dents and hail damage without affecting a vehicle’s original finish. 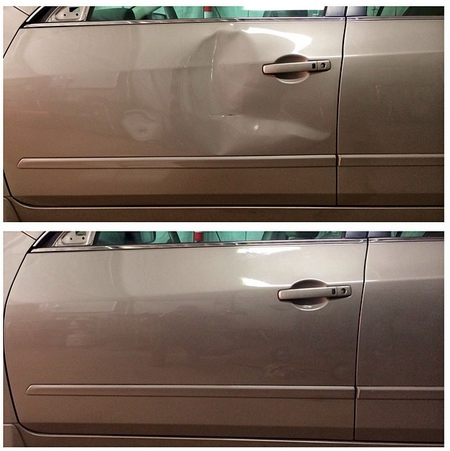 PDR involves no filling, sanding or painting, so it is a quick, minimally invasive and cost-effective way to restore a lightly damaged car to its original condition. He may decide to access the damaged area from the back side the dented panel. First, he’ll carefully remove any interior trim panels (plastic covers, insulation, carpeted panels, etc.) that block his way. Using a selection of tools specifically designed for the location, size and depth of each dent, the technician gently unbends the affected metal or plastic by slowly, gracefully, massaging the metal back into place. He confirms the effectiveness of each action by examining the result on the outside. He may sometimes use other tools on the exterior side to refine his action. Alternatively, your PDR technician may decide to make the repair from the outside of the vehicle with a process called glue pulling. In this case, he will temporarily glue a series of differently shaped and sized plastic caps on the outside of the vehicle, which he uses to gently pull on the metal to unbend the dent. Then he will massage the metal down until it is restored to its original shape and position. The underlying principle is the same for both processes. By gradually unbending the affected metal or plastic, the PDR technician can repair your vehicle without compromising its exterior finish. 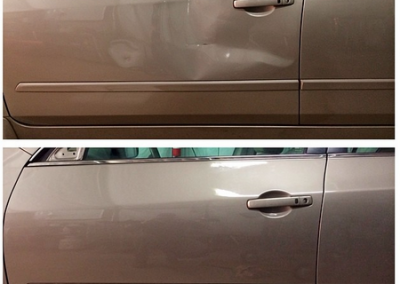 Why Choose Dent Shop’s PDR? Your car maintains its factory finish, so you won’t be left with an imperfect color match, overspraying, an incomplete seal, or damage to adjacent painted surfaces. 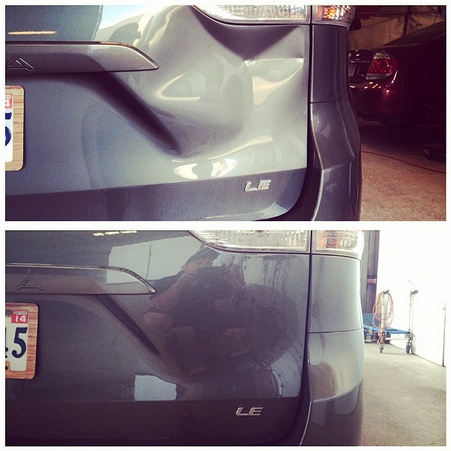 Dent Shop works with all insurance companies to facilitate your repair. All you need to do is obtain a claim number and we’ll do the rest. 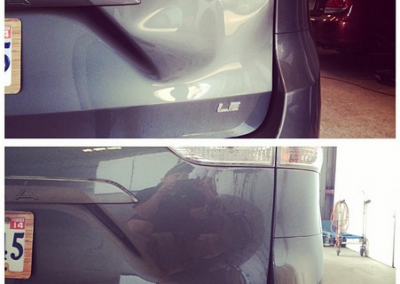 Dent Shop PDR technicians are very knowledgeable about most car makes. They skillfully remove and replace interior panels without harming your vehicle’s appearance and integrity. PDR protects your investment in your vehicle. A repainted vehicle loses value in the market because repainting suggests deeper repairs and perhaps future problems. Time in our PDR facility is usually less than a day and, in any case, significantly shorter than a body shop repair and repaint. 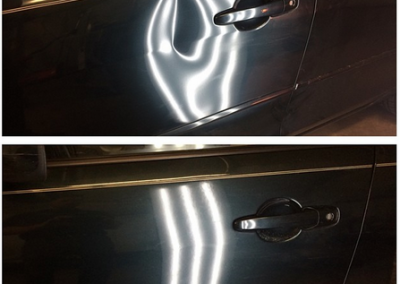 PDR is easier on the environment: Dent Shop specialists achieve exceptional results without sanding and painting. Our procedure is clean and our tools are reusable.